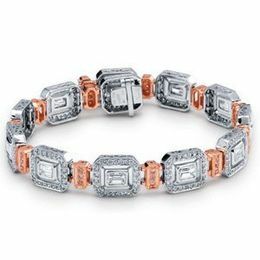 INVEST IN A CLASSIC MASTERPIECE ~ SIMON G DIAMOND ENGAGEMENT RING WRAPPED IN HAND SET DIAMONDS This Classic Simon G. Engagement Ring is set in 18 karat white gold. It showcases a stunning halo with .33 carat total weight of round white diamonds and .34 carat total weight of complimenting trapezoid side stones. The fine detail and splendor of a Simon G diamond engagement ring on your bride's finger is a true display of your esteem and affection. The mounts and settings display exquisite detail and the highest quality of craftsmanship. The Classic 18k Simon G Diamond Engagement Ring is designed so the stones reflect the light for maximum sparkle. 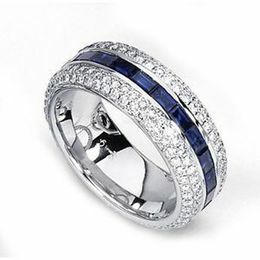 Each Simon G Classic Engagement Ring is made for comfort too, since your bride will be wearing it forever, the fit and comfort are another detail Simon G is serious about in their spectacular ring designs. 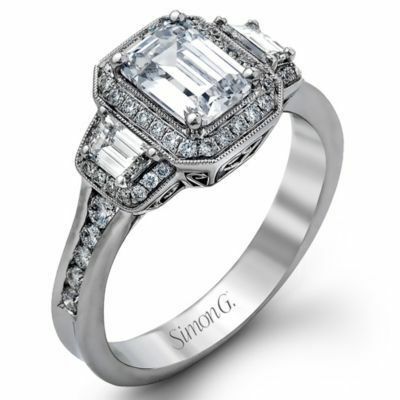 ENJOY THE FILIGREE AND DIAMOND HALO SETTING IN THIS CLASSIC SIMON G ENGAGEMENT RING!